Your Natural packaging: the tray wrap! 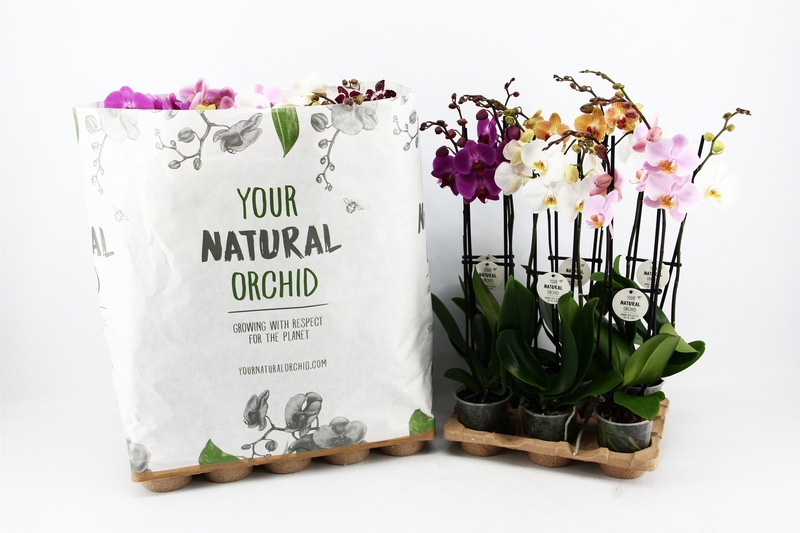 We thought: why not package our Your Natural Orchids in an eco-friendly way? That was the inspiration for our paper tray wrap. From now on, our Phalaenopsis will not be packaged in environmentally harmful plastics, as we’ll now wrap the entire tray in paper instead! It’s the perfect packaging for businesses like garden centres and florists that immediately unwrap our plants. Saving 58 tonnes of plastic use each year! From now on, one paper tray wrap will replace the plastic required to package ten plants individually. The tray wrap perfectly complements the ten-hole or six-hole paper pulp EcoExpert trays, and provides a more eco-friendly look. The potential savings are enormous: at 58 tons of plastic a year, this is the equivalent to the total CO2 emissions of a car driving around the planet ten times! The new packaging also has a reduced environmental impact compared with the well-known Danish box, which requires a lot of cardboard. Even this minimal amount of packaging materials fully retains the protective properties of the packaging. The material can even be recycled, as one of paper’s main advantages is that it can be reused much more easily compared with plastic. The tray wrap is yet another example of Stolk Flora leading the way. Who will follow?